Moshana had been attending Brightside Dental on and off for a few years and had been unhappy with her smile for a number of years. She had orthodontic treatment in the past which hadn’t given her the smile she wanted. Her main concerns were the colour of the teeth, especially two front teeth which had darkened following root canal treatment and also that the front teeth were uneven. We created a plan for treatment around 2 years ago, but for various reasons it wasn’t the right time for Moshana to go ahed. Working as an actor and wanting to progress further in her profession, Moshana recently made the decision to proceed with the treatment and understandably had some concerns about how well it would work given her disappointments in the past. We carried out a course of teeth whitening to improve the general colour of the teeth and then placed porcelain crowns on the two discoloured teeth for them to match the natural teeth. The treatment was completed as planned in a number of weeks. 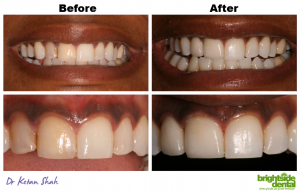 Moshana is super happy with her new smile, which exceeded her expectations of what could be achieved and feels it will be a real boost to her confidence as she was previously often reluctant to smile. There are many ways we can improve people’s smiles, many of which are very simple and cost-effective. If you would like to know how we can help you call us on 020 88884401. This entry was posted in Treatments and tagged Brightside Dental, cosmetic dentist london, cosmetic dentistry, Dentist London, Dentist North London on 10th April, 2019 by Brightside Dental.